Google Analytics is a monster. It’s big, intimidating, and takes a long time to learn. The courses available at Google Analytics Academy are extremely helpful, but in my experience, the best way to learn is to have a specific question, then look around until you find the answer. Fortunately, once a Google Analytics account is set up, that’s all you do. You just look around at all the ways your data can be presented. Unfortunately, if you set it up incorrectly, the data will be dirty — or if you REALLY mess up, you’ll have no data at all. Processes and standard operating procedures are important for this reason. Big shops that make a habit of creating Google Analytics accounts for their clients need a system for quality control. Analytics newbies should be able to follow a process and crank out the same quality Google Analytics account as an analytics veteran. I’ve reviewed enough Google Analytics accounts to know this doesn’t happen in practice. The most common offense (the one I’m about to cover) doesn’t even make sense, because you have to go out of your way to make it. It might not be your fault. You might not even know that you’re doing it. Regardless, I’m asking you, please. 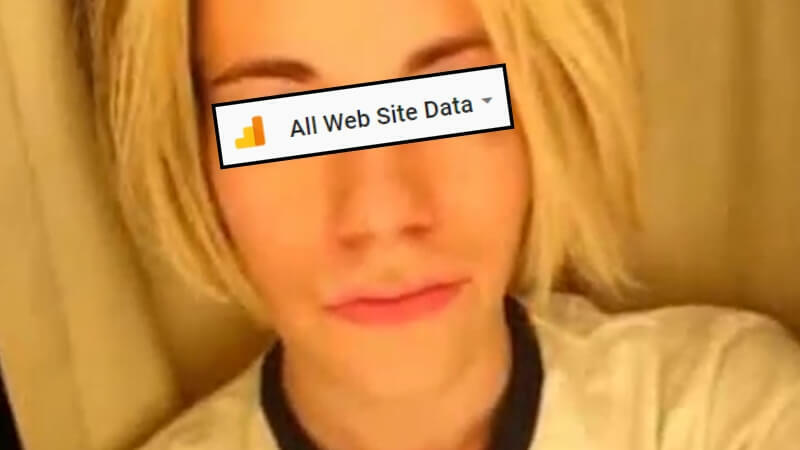 Leave All Web Site Data alone. What Is All Web Site Data? 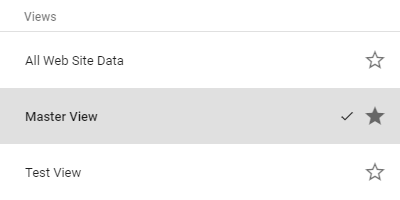 All Web Site Data is the default view in Google Analytics. Unless you make an additional view or choose to name it something else, it will be the only view for any given property. The data for this view is raw and unfiltered. Again, unless changes are made to this view, it will pass all data from the property. That’s why it’s called, “All Web Site Data”. It tracks everything. Before going any further, it makes sense to briefly review the hierarchy of a Google Analytics account. Account — The highest organizational tier in Google Analytics. For the majority of cases it makes sense to think of an account as a business, meaning the naming convention for the account is the name of the business (or individual, if you’re a sole proprietor). Property — A website, or if you’re fancy, a mobile app or point of sale system. Businesses can own multiple websites. As such, accounts can contain multiple properties. The most intuitive naming convention for a website property is its domain name (e.g. codysee.com). View — The lowest tier in Google Analytics and the viewpoint for your data. Properties can (and should) have multiple views based on how you want to filter your data. They’re messing with the view known by default as All Web Site Data. They’re naming it something else, like the domain name (which should be the name of the property). They’re adding filters to the view, such as excluding their own visits to the website. They’re altering settings which, once done, cause irreversible damage to the data. People are doing this to exclude data they don’t care about. The problem with doing this to your one and only view is that excluded data can’t be recovered, because changes made to a view only affect data collection moving forward, not in the past. My answer is this: I don’t know, and neither do you. Nobody knows until a situation occurs in which they wish they had it. It’s kind of like throwing a pizza party and finding out one of your guests is gluten-free. You probably didn’t buy gluten-free pizza, because you didn’t anticipate that situation happening. You could deflect blame, directing it to the restaurant which said they didn’t make gluten free pizza, or place it on the victim, calling them ungrateful for refusing the pizza you’ve so graciously provided. Both show your shortcomings as a host, because the truth is you should have followed best practices and asked your guests before the party if they had any dietary restrictions for which you could accommodate. Put that way it seems obvious, doesn’t it? If you agree, you should follow best practices when it comes to views in Google Analytics, that way you don’t have to apologize for your shortcomings as a marketer. Most Google Analytics experts will tell you to create three views. I’m only adamant about two. All Web Site Data. Change the name if you find it unintuitive. Unfiltered View and Raw Data are popular alternatives. However, if you do decide to change the name, let that be the only thing you change about this view. Do not filter the data in any way. Leave it alone. Master View. Sometimes called Main View. This is your primary reporting view. You should exclude hits from bots, filter out internal traffic, and remove anything else that you consider irrelevant. Test View (Optional). This is an optional view for testing things like custom events, newly created goals, IP exclusions, and so on. For tiny accounts this may be overkill, but it’s still a good idea. This can help if you frequently aggregate data across multiple properties, otherwise, it’s a purely cosmetic personal choice. The names of your views don’t change what data gets collected. Makes sense? Good. Now implement it across your account(s) and make the digital marketing world a better place! P.S. The featured image is a play on the meme, “Leave Britney Alone“. I thought it was better known than it actually is, since some have told me they don’t get it. Here’s the original viral video from 2007. I guess I’m getting old.